In my last memorandum, I discussed the opportunity to unleash the power of data to benefit all Americans. Now that it’s been six months, I wanted to provide an update on my team’s progress. As I’ve had a chance to explore the different areas we’re working on across the government, it’s clear that this is the most data-driven Administration we’ve ever had. So, what does a data-driven government look like? It’s a connected organization that responsibly gathers, processes, leverages, and releases data in a timely fashion to enable transparency, create efficiencies, ensure security, and foster innovation to benefit the nation. Mission of the U.S. Chief Data Scientist: Support the President and the Administration in responsibly unleashing the power of data for the benefit of the American public and maximize the nation’s return on its investment in data. My team is helping federal departments and agencies as they work to ensure: (1) they are using data to benefit all Americans; and (2) they using the data available responsibly. Recruiting and retaining the best minds in data science for public service. The only way to make sure the federal government is using data responsibly is to engage with the public directly to seek input on what are acceptable uses of data. One example of how the Administration is working to ensure data science benefits all Americans, while also providing for responsible data use, is the Precision Medicine Initiative (PMI). The mission of PMI is to enable a new era of medicine through research, technology, and policies that empower patients, researchers, and providers to work together toward development of individualized treatments and disease prevention. To do this, we are collaborating with the public to get your input and support. Everyone who participated in our Twitter chats (#PMINetwork), National Institutes of Health (NIH) workshops, listening sessions, and wrote letters gets a big THANK YOU. Your help has been invaluable as we continue working on this incredible opportunity. For example, we’ve heard clearly that we need to ensure that the participant/patient is central to the project and their data is treated responsibly. With that feedback in mind, we recently announced our privacy and trust principles. 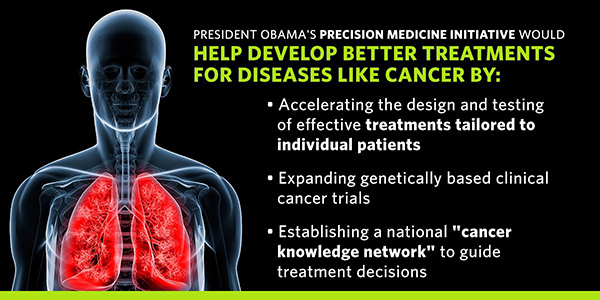 August 8 was an exciting day, as we welcomed our Precision Medicine “Champions of Change” to the White House. Make sure to watch the full video of the event to learn more about the progress being made. If you’re interested in learning more about the sessions on Precision Medicine hosted by the NIH, visit here. The Precision Medicine Working Group closely reviewed feedback from those sessions and will publish their advice to the NIH Director this fall. Our data team is also continuing efforts to utilize and unleash data to improve lives. Thanks to the President’s Executive Order requiring that agencies make data open and machine readable, by default the power of data is being unleashed for all Americans. 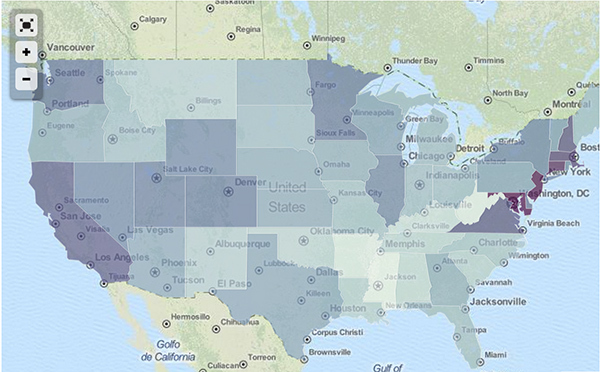 Data.gov hosts more than 130,000 datasets from nearly 80 agencies and 37 state, county, and city data catalogs. There are more than 8 million page views annually and we’re just getting started. Take the Department of Commerce, which recently announced a big data project with Google, IBM, Microsoft, Amazon, and the Open Cloud Consortium to improve all the products that help people respond to the weather and the environment. The goal of this project is to liberate more than 50 terabytes per day of previously inaccessible information — for free — by combining government expertise with private-sector technological capabilities. Doing so will fuel new business innovation and support the Administration’s Climate Data Initiative. Another example of using government data to help make people’s lives better was after the Nepal earthquakes and the incredible grassroots effort by data scientists around the world to use open data to help first responders and aid workers better understand the situation around them. To get a sense of the power of all these efforts, check out the talk I participated in at the International Open Data Conference (and hey, PDFs shouldn’t be considered “open data”!). Another example of the power of data to improve lives is through criminal and social justice efforts. Criminal justice systems — from small towns to massive cities — collect a lot data on the people and cases that move through them. Virtually every law enforcement action has a record associated with it. Minorities, the poor, and those with mental health concerns have a disproportionate number of interactions with law enforcement. If all of the data from law enforcement were effectively captured, analyzed, and shared, imagine how the effective sharing and analysis of that data could advance proven reforms, increase efficiency, and prevent injustices. The recommendations from the Taskforce on 21st Century Policing called for the novel use of technology to tackle this social justice opportunity in the immediate term. One of the first projects, announced by the President in Camden, New Jersey, is the Police Data Initiative (PDI), which focuses on generating and implementing new data and technology innovations within key jurisdictions, civil society groups, and federal, state, and local agencies. PDI is centered on two key components: (1) using open data to build transparency and increase community trust, and (2) using data to enhance internal accountability through effective analysis. PDI has mobilized 26 leading jurisdictions across the country, bringing police leaders together with top technologists, researchers, data scientists, and design experts to use data and technology to improve community trust and enable a shift towards data-driven community policing. This incredible effort has been led by two Presidential Innovation Fellows, Denice Ross and Clarence Wardell. To see the power of their efforts, read Denice Ross’s story about working directly with the police and youth in New Orleans and how New Orleans Police Superintendent Michael Harrison came to write his first line of code. Here’s what’s next: We want to hear from you. This is just the start, and I’ve been humbled by the support from all of you on our efforts. I’ve had the chance to meet many of you, on topics ranging from why community college is so important to hacking on civic data in South Bend, Indiana, and in the inner city of Chicago. And I hope to meet many more of you through future events. Data science is a team sport, and we need your ideas, suggestions, and feedback to make it work! You can send those my way here on Medium with a response, or (for those thoughts and suggestions that can fit within 140 characters), tweet them to me at @DJ44. I look forward to sharing more updates as we continue making important progress on data usage.This post was originally published on The White House’s Medium channel by Dr. DJ Patil, the U.S. Chief Data Scientist.